Undaunted would not have come this far without the help of people like you, and we need your help as we finish the project and raise funds to expand the science-based programs at The Bioreserve. We told you your name would be engraved on a plaque to be displayed with the boat after it's voyage. What we didn't tell you was that I will be engraving your name on that plaque along with the coordinates of where I am at the time as I make my crossing of the Atlantic! This also goes for anyone donating from now to the day I make landfall! If you donate after I set sail, your name will be transmitted to me while I sail across the ocean. Thank you to everyone who has and will donate to make this incredible adventure and educational opportunity happen. Your donation through our GoFundMe page will help us pay for the final outfitting of Undaunted; after the little boat is ready, all donations will go to The Bioreserve's mission of science and outdoor education. Tell your friends and family about the Little Boat Project. We hope that this adventure will inspire more people to take chances and explore the possibilities of the world around them. Like us on Facebook or follow our Instagram to get updates and share with your friends! Undaunted owes the fabrication of its hull, custom sails, safety equipment, and food to both corporate and private sponsors. The following list will always be incomplete, in part due to the number of cash donations we have received, but we hope that everyone we've come in contact with along the way knows how much we appreciate their input and support. Freeze dried meals for the duration of the trip. 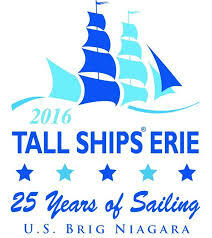 Hosting Undaunted and helping us promote and thank our Erie, PA sponsors.